My husband loves clam pasta. He orders it on occasion when we are out to dinner, because in the past I’ve never made it at home. Really, he just loves anything with clams in it. I sadly, do not like clams. I just can’t get over the texture. 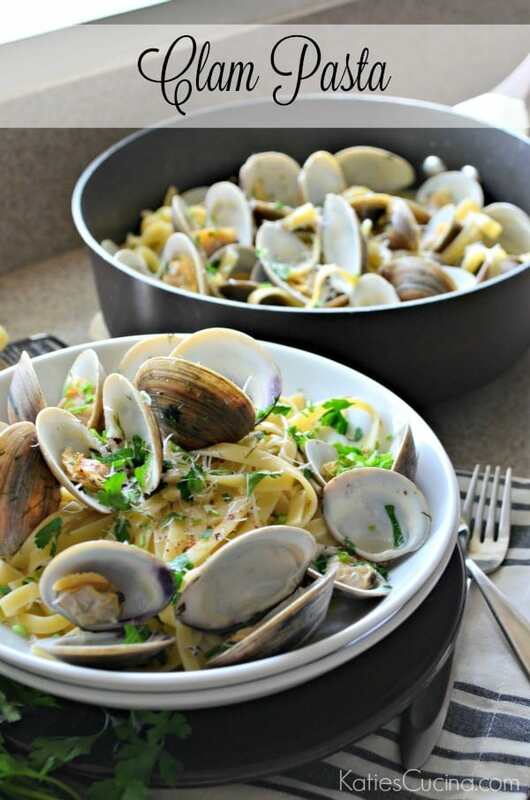 Over the Christmas holiday I bought a big old bag of clams for my husband and promised him I would make him baked clams as well as clam pasta. He was over the moon excited. 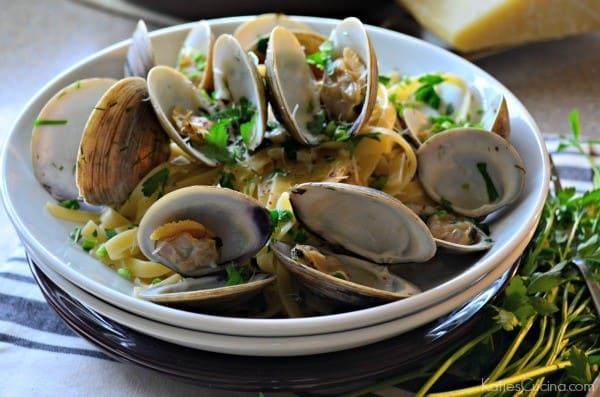 My mother in-law has made clam pasta threw the years so I consulted with her on cooking method and any tips and tricks. The main tip when cooking clams is to wash them very well. As they can tend to be gritty. You can do a pre-soak in cold water and cornmeal for a good 30 minutes. The cornmeal helps get the grit off the clams. Seriously, I have no clue the logic behind this other than trust me it really works. I’ve used this method for years. And another tip if you are new to cooking clams. You need to cook them until they open. This typically takes about 10 minutes. If a clam does not open it means it’s bad and you should discard the clam immediately. The same goes with clams that have broken shells. Remove the clam–it could be bad, and the last thing you want to do is take a chance with seafood. No thanks! Because I purchased farmed clams they weren’t as gritty so I just needed to do a quick rinse and I scrubbed each and everyone clam just to ensure there was nothing on the outside of the shell. The entire recipe from start to finish took me about 30 minutes. Which for a fancy restaurant-like meal is perfect! Your not slaving in the kitchen for hours yet you yield a restaurant quality meal at home. Win-win in my book. 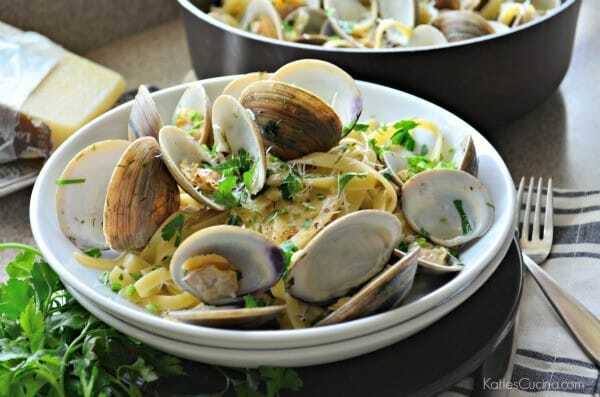 If your looking for a fancy meal to make the clam lovers in your life, I highly suggest you try my recipe for clam pasta! Fill a large pot with water and 1 tablespoon salt. As soon as the water begins to boil place the pasta in the pot and boil for 10 minutes until al dente. Drain pasta and set to the side. While the pasta is cooking, melt the butter and bacon fat in a large skillet. Then add in the minced garlic and cook for 5 minutes on medium heat until fragrant and golden but not burnt. 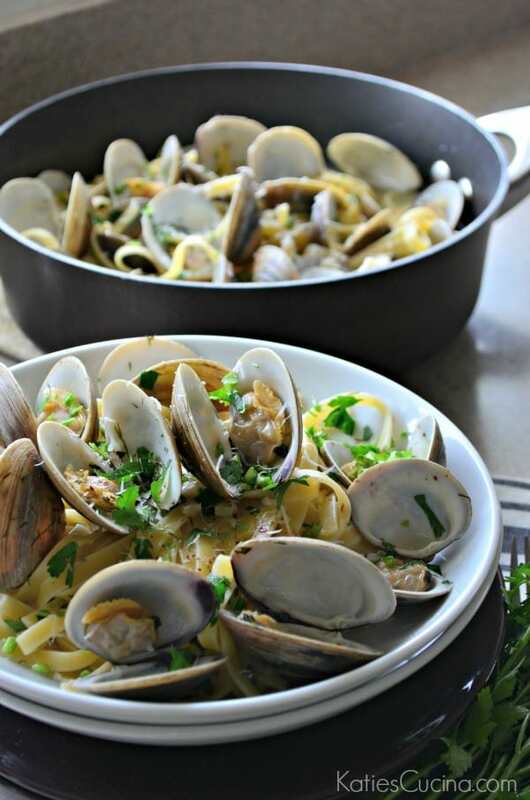 Then carefully place the littleneck clams in the pan, pour the wine on top and place a lid on. Cook the clams for 10 minutes until they are opened. Once the clams are done cooking, (making sure there are no clams that didn't open if there are discard those clams). Remove half of the cooked clams from the skillet. In a small bowl, make a slurry of cornstarch and water and add it to the pot. Mix well then add the dill, crushed red pepper flakes and fresh parsley. Once mixed well and sauce is a little thicker add in the pasta. Mix well and add in the remaining clams. Divide evenly among plates and enjoy immediately. Top with grated Pecorino Romano cheese and additional fresh parsley if desired. *If you don't have rendered bacon fat you can just use an additional tablespoon of butter. The bacon fat is used to give a flavor boost. This looks delicious. You mention soaking the clams in water with cornmeal for 30 minutes. How much cornmeal do you use?